Arizona Prison Watch: Prosecutors and Private Prison Profits: Mark Brnovich for AZ AG? Prosecutors and Private Prison Profits: Mark Brnovich for AZ AG? Beau Hodai has done some excellent work exposing the mechanisms of the American Legislative Exchange Council (ALEC), as well as the politics of private prisons in Arizona. Check him out at DBA Press most days. I hate to think that anyone could be a worse Attorney General than Tom Horne, but this guy sounds like really bad news (just look at who loves him: they want that disbarred idiot, Andrew Thomas, to run for Governor, too - though if you click on thaticon, it goes to a bankruptcy lawyer, haha!). Earlier this year, DBA Press and the Center for Media and Democracy launched an investigation of the influence of the private prison industry on state policies. The review of public records this summer revealed a surprising connection between Arizona Department of Gaming Director Mark Brnovich and the Corrections Corporation of America . In the midst of this story being written, Brnovich announced he would be leaving his post in state gaming regulation, which paves the way for him to seek the post of state Attorney General. A former Corrections Corporation of America “senior director of business development” and lobbyist is planning to run for the office of Arizona's top law enforcement officer, Attorney General. Brnovich, a Republican, would likely be challenging incumbent Arizona Attorney General Tom Horne in the 2014 Republican primary election for the office. Over the past year, Horne has been the subject of both federal and Maricopa County investigations into alleged campaign law violations, in that Horne allegedly coordinated with an independent expenditure committee in the creation of negative ads targeted at his Democrat opponent during the 2010 election. According to statements of financial disclosure filed with the Office of the Arizona Secretary of State Division of Elections by Brnovich’s wife, former Maricopa County Superior Court Commissioner and current Maricopa County Superior Court Judge Susan Brnovich, Mark Brnovich served as a “senior director of business development” for CCA during the course of 2005, 2006 and 2007. CCA was not Brnovich's sole source of employment during at least part of this time. He also worked as a federal prosecutor while working for or on behalf of CCA during part of this time, according to the financial disclosure forms of his wife. Neither Mark Brnovich or CCA Senior Director of Public Affairs Steve Owen responded to multiple inquiries relating to either the nature or duration of Brnovich’s employment with CCA. Mark Brnovich worked as a CCA “senior director of business development” commencing in 2005, also appears to have coincided with the year in which Brnovich was also employed as the “director of the Center for Constitutional Government” at the influential Arizona group, the Goldwater Institute (for more on the Goldwater Institute, see ). Additionally, records indicate that Mark Brnovich served as a Maricopa County judge tempore throughout his entire tenure as “senior director of business development’” for CCA. The two worlds of Brnovich’s public service/public policy development and for-profit prison corporation employment seem to have merged fully in 2007, a year in which Brnovich worked both on behalf/for CCA and for the federal government. The reason for stressing the minutiae of Mark Brnovich’s lobby activity/employment on behalf of CCA over the course of 2007 is this: according to a statement of financial disclosure filed by Susan Brnovich on January 24, 2008, Mark Brnovich had two sources of personal compensation over the course of calendar year 2007. Those two sources of compensation were: Corrections Corporation of America and the United States Attorney's Office. In connection with these cases, four individuals served substantial pre-trial detention time (from between several months to a year and a half) in the custody of the Department of Justice’s (DOJ) U.S. Marshals Service (USMS), or in the custody of a “designated representative” thereof. It is not known if such a “designated representative” in these specific cases was CCA, but two of CCA’s facilities in Arizona primarily serve the federal court system: the Central Arizona Detention Center (2,304 beds) and the Florence Correctional Center (1,824 beds), both of which are located in Pinal County -- which neighbors Maricopa County and Phoenix, home to the Sandra Day O'Connor U.S. Courthouse, to the north; and Pima County and Tucson, home to the Evo A. DeConcini U.S. Courthouse, to the south. In 2007, CCA had a combined total of 4,128 detention and correctional “beds” under contract with the USMS. Arizona was the epicenter of CCA's involvement with USMS in 2007. Of the total 6,885 CCA beds under contract with USMS during that year, only 2,757 were located outside of the state of Arizona -- and of that number, 910 beds contracted with USMS were located in CCA's Torrance County Detention Facility, in Estancia, New Mexico, leaving the remaining USMS beds were scattered through three facilities in Leavenworth, Kansas (767 beds), Laredo, Texas (480 beds), and Mason, Tennessee (600 beds). These four cases also resulted in a total combined 343 months (roughly 28.6 years, or approximately 10,290 days) of prison sentences to be served in the custody of the Federal Bureau of Prisons (BOP) by defendants convicted and sentenced through prosecutions of which Brnovich was a part, while apparently still employed by or on behalf of CCA. Brnovich commenced these prosecutions while still apparently working for or on behalf of CCA, but none of these defendants were sentenced until 2008. During the time of Brnovich’s apparent career overlap between CCA and the U.S. Attorney’s Office in 2007, CCA held contracts for the incarceration of BOP prisoners in the California City Correctional Facility (2,304 beds in California City, California), the McRae Correctional Facility (1,524 beds in McRae, Georgia), the Cibola County Correctional Center (1,129 beds in Milan, New Mexico), the Northeast Ohio Correctional Center (2,016 beds in Youngstown, Ohio), and the Eden Detention Center (1,293 beds in Eden, Texas). [Note: actual CCA BOP per diem rates for 2007 are not known. Furthermore, according to CCA SEC filings, per diem rates fluctuate between facilities based upon “actual or minimum guaranteed occupancy levels” specific to each contract. (For more "lockup quotas," see the new report by In the Public Interest: "Criminal--How Lockup Quotas and 'Low Crime Taxes' Guarantee Profits for Prison Corporations ") The above-given range is a conservative estimate based on known current and past CCA per diem rates with a variety of governmental clients. For example, according to the U.S. Department of Justice’s Office of the Federal Detention Trustee, the average per diem rate paid to a private contractor under a direct contract with USMS in 2007 was $86.20, but the state of Arizona currently contracts medium security beds with CCA at a per diem rate of $65.43 (these beds go online in 2014 at CCA’s Red Rock Correctional Center, also located in Pinal County). 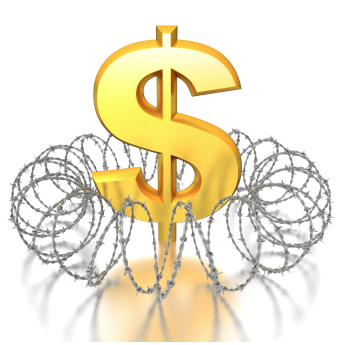 Adjusting for per diem rate fluctuations as well as rate reductions in cost through contractual occupancy, a range of $50 to $90 per prisoner per diem is a fair, conservative estimate. This is not to suggest that boosting the corporation’s bottom line through these prosecutions was either CCA’s or Brnovich’s intention. According to Executive Office for United States Attorneys (EOUSA) General Counsel's Office Management Analyst Lucy Hurley, Assistant U.S. Attorneys are not required to file any financial disclosure other than a statement disclosing conflicts of interest, should any exist, with each individual case they are assigned. According to Hurley, these disclosures are known as EOUSA Forms GC01. The office’s Public Affairs Officer Cosme Lopez initially stated that his office would be more than willing to aid in locating disclosure material, if any, pertaining to former Assistant U.S. Attorney Mark Brnovich, but subsequently Public Affairs Officer Debra Massey stated, on September 12, that no question relating to Brnovich (including such rudimentary questions such as those pertaining to Brnovich's dates of employment as an assistant U.S. attorney general), or any other matter, would be answered without the submission of a formal FOIA request, which DBA/CMD did but for which the federal government has not responded. Puryear was nominated as a federal judge in the United States District Court for the Middle District of Tennessee by President George W. Bush on June 13 of 2007. This nomination occurred while Puryear was still acting as a CCA executive vice president and general counsel. As a matter of fact, according to SEC records, Puryear purchased 31,100 shares of CCA stock through his employee stock options a little more than two months following his nomination, increasing his total CCA stock holdings at this time to more than 65,000 shares. Due to public outcry, Puryear's nomination was not confirmed. The public campaign  against the confirmation of Puryear was organized largely by former CCA prisoner and current Prison Legal News Managing Editor Alex Friedmann. In response, CCA, through its corporate blog, "thecca360.com," published a graphic account of Friedmann's criminal history in an effort to discredit him and derail opposition to the Puryear nomination. After the failed nomination, Puryear departed from CCA in 2010 (he had been employed by CCA since 2001). From July through December of 2007, this group of CCA lobbyists expended an additional $1,320,000 in lobby activities that included the explicit purpose of lobbying on the issue of the privatization of BIA detention facilities. During the second half of 2007, this CCA executive lobby group also commenced lobbying activities against the Private Prison Information Act of 2007 (“PPIA 2007”), this bill would have brought private prison corporations under contract with federal agencies under the purview of the Freedom of Information Act. CCA vehemently opposed PPIA 2007, as well as PPIA 2009 and PPIA 2011. For more on CCA's opposition to PPIA, see FAIR's analysis ), as well as the Public Safety Act (PSA), which would have banned federal use of private prisons/detention centers. This group of CCA executives/lobbyists added the i “code” for immigration policy to their list of general lobby activity for the first time in 2007, though no specific bill was identified during that year. This is not to say that this was the genesis of CCA's interest in immigrant detention. This was simply the first time this issue code had been used by this set of lobbyists. Lobby reports filed by the CCA executive lobbyist group from 2008 to 2010 and beyond show a distinct shift of focus from BIA detention facility privatization to activity more centered on matters relating to ICE immigrant detention. According to lobby disclosure records filed with both the House Clerk and Senate Office of Public Records, the CCA executive lobby group did expend an additional $2,010,000 on lobby activity from 2008 through 2009 that included the lobbying of BIA on “issues related to the private prison industry,” although this activity does not appear to have been the primary focus of lobby efforts as it was during 2004 through 2007. The sole explicitly-stated issues identified by the CCA executive lobby group during 2008 and 2009 pertained to PPIA, PSA, the Prison Safe Communications Act, and several appropriations bills relating to ICE immigrant detention. According to federal lobby records, the CCA executive lobby group ceased all BIA lobby activity after the fourth quarter of 2009. Another consideration is this: at various times over the course of 2009 and 2010 CCA, Geo Group , and Management Training Corporation were part of the American Legislative Exchange Council  (ALEC). It was at the December 2009 ALEC meeting that then-Arizona Senator and ALEC leader Russell Pearce introduced a piece of immigration legislation to the ALEC Public Safety and Elections Task Force (PS&E), a task force which CCA previously chaired and which it had been active member for almost two decades. This “model bill,” once adopted by corporate lobbyists and legislators through ALEC (through an unanimous vote, in which CCA claims it took part), became known as the “No Sanctuary Cities for Illegal Immigrants Act,” otherwise known as “SB 1070,” upon its introduction to the Arizona State Legislature, a month and a half later, in mid-January of 2010. This bill -- which effectively would essentially compel every municipal, county and state law enforcement officer to perform the duties of immigration enforcement officers under certain circumstances -- was promoted to state lawmakers nationwide through ALEC, which was funded in part by private prison companies and other national corporations like Koch Industries, the National Rifle Association, and the American Bail Coalition.CCA and the other private prison companies also funded ALEC’s PS&E task force, which distributed the bill. As such, it could be argued that a substantial portion of CCA's business growth model may have shifted to the state level around the period of 2009 and 2010, as state immigrant detention policies began to get traction. For more on this, see DBA Press . Parts of SB 1070 have been struck down  by the courts. Notably, one of the roles of the Attorney General is to defend state legislation like SB 1070 in state and federal court challenges. So, in broad strokes, what are we looking at here? From all these numbers, a clear pattern emerges: from 2004 through 2007, CCA executives expended almost $11 million lobbying, primarily for their sole explicitly-stated lobbying purpose: the privatization of Bureau of Indian Affairs detention centers. These years overlap with the known years of Mark Brnovich’s employment with or on behalf of CCA (2005 through 2007). These facts may provide an interesting insight into the possible nature of Brnovich's employment with or on behalf of CCA. Indeed, of the ten individuals Brnovich prosecuted during his period of apparent overlap between employment by/on behalf of CCA, and the U.S. Attorney’s Office for the District of Arizona, all but one of these individuals were accused of either crimes committed against casinos operated by Indian tribes on Indian lands (pertaining to thefts/embezzlements perpetrated against casinos owned and located within the Salt River Indian Community and the Gila River Indian Community, in or near the Phoenix metropolitan area), or against Indian individuals committed in “Indian Country” (specifically, Navajo male accused of deliberately wounding another Navajo male with a .22 caliber rifle on the Navajo Reservation in northern Arizona). Just as Arizona was the focal point of CCA's involvement with the U.S. Marshals Service (USMS) in 2007, and as Arizona was the epicenter of state-based immigration enforcement via “model legislation” from CCA-funded ALEC in 2009 and 2010, Arizona is an excellent starting point for any for-profit prison corporation looking to incarcerate Indians. The state contains nearly 240,000 members of 22 tribes, living on nearly 15 million acres of tribal land. Perhaps most notably, the bulk of the Navajo Nation (consisting of the Navajo Reservation and Navajo Nation off-reservation trust land) is contained within Arizona. But what of Brnovich's employment record prior to his 2010 appointment to ADG? With regard to any potential conflicts of interest stemming from Brnovich’s employment by both the U.S. Attorney's Office and CCA during 2007, Medina stated “I really don't have any personal information on that,” and referred further inquiry to the U.S. Attorney’s Office and CCA. As previously noted, the Office of the U.S. Attorney for the District of Arizona has refused to answer any questions relating to Brnovich’s employment, or disclosure of conflicts of interest, without a formal FOIA request. Such a request has been filed with both the Arizona U.S. Attorney's Office and the Executive Office of the United States Attorney. These requests have not been answered. Neither Brnovich or CCA Senior Director of Public Affairs Steve Owen responded to multiple inquiries relating to either the nature or duration of Brnovich’s employment with CCA. DBA/CMD submitted a public records request to ADG for copies of any and all records pertaining to background checks conducted regarding Mark Brnovich. In response, Medina delivered (on September 18) a grand total of three pages of documents: a letter from then-Arizona Senate President Bob Burns to Arizona Secretary of State Ken Bennet, announcing the Senate's approval and confirmation of Brnovich's appointment (dated May 26, 2009); a congratulatory letter from Governor Brewer (an ALEC alum whose closest advisors include former CCA reps) to Brnovich notifying Brnovich of the Senate’s confirmation of his post (dated May 28, 2009); and a loyalty oath signed by Brnovich (dated April 20, 2009). In the loyalty oath, he pledged that as Director of the Arizona Department of Gaming he would support and defend “against all enemies, foreign and domestic” the constitutions and laws of both Arizona and the United States. Brnovich also agreed that, should he commit, aid or advocate “the commission of any act to overthrow by force, violence or terrorism [...] the government of this state or any of its political subdivisions,” he would be discharged from office without compensation, or future compensation -- including any benefits. As stout as this oath of office may be, at no point in the oath was Brnovich asked to address any past potential conflicts of interests. Beyond these ADG records, a confirmation hearing on Brnovich's ADG nomination was held before Arizona Senate Committee on Commerce and Economic Development (CCED) on May 19, 2009. As part of this confirmation process, Brnovich provided the committee with biographical data, which consisted of a two-page resume. 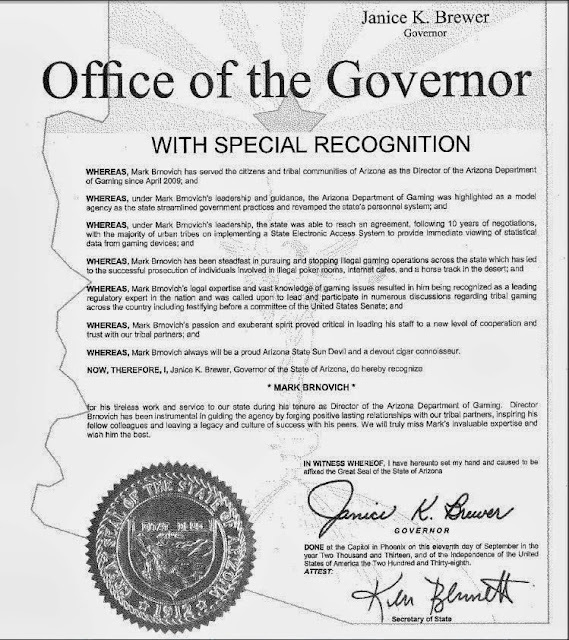 According to the office of Arizona Senate Resources, this is the sole piece of documentation pertaining to the Brnovich ADG nomination on file with the Senate. That document disclosed both his past employment with CCA (dates given as “2005-2007”) and the Office of the U.S. Attorney for the District of Arizona (dates given as “2007-2009”). During this confirmation hearing for the state’s gaming regulation office -- which lasted exactly two minutes and fifty-seven seconds (including Brnovich's statement, questions, unanimous vote for confirmation, and congratulations) -- Senators had the opportunity to ask Brnovich questions pertaining to his suitability for the position, employment history and any potential past or present conflicts of interest. Only one question, posed by then-CCED Chair Sen. Barbara Leff, was asked of Brnovich during the hearing. On September 18, DBA/CMD submitted a public records request to the Office of Arizona Governor Brewer seeking any and all records pertaining to Brnovich’s appointments to, or assessments for suitability, as ABG Director and COPE Chairman. The governor’s office has not yet responded to this request. -- CCA Securities and Exchange Commission 2007 form 10-K (annual report ). -- 2004 mid year . -- 2004 year end . -- 2005 mid year . -- 2005 year end . -- 2006 mid year . -- 2006 year end . -- 2007 mid year . -- 2007 year end . -- 2008 Q3 Amended . -- 2:06-cr-00717-DGC-1 USA v. Kabaklic et al (Ismar Kabaklic) . -- 2:06-cr-00717-DGC-2 USA v. Kabaklic et al (Adnan Alisic) . -- 2:06-cr-00717-DGC-3 USA v. Kabaklic et al (Bakir Mujkic) . -- 2:06-cr-00717-DGC-4 USA v. Kabaklic et al (Danijel Mujkic) . -- 2:06-cr-01114-MHM All Defendants USA v. Williams (Shayla Williams) . -- 2:07-mj-06265-DKD All Defendants USA v. Veit (Randall James Veit, first case) . -- 3:07-cr-01177-GMS All Defendants USA v. Comb (Rayaundal Comb) . -- 2:07-cr-01220-NVW All Defendants USA v. Santillano (Shirley Cota Santillano) . -- 2:07-cr-01211-DKD All Defendants USA v. Veit (Randall James Veit, second case) . -- 2:07-cr-01221-JAT-1 USA v. Beal et al (Jason Carter Beal) . -- 2:07-cr-01221-JAT-2 USA v. Beal et al (Fernando Lechuga) . -- Susan Brnovich statements of financial disclosure, 2005 through 2012 . -- CCA 2007 Arizona lobbyist registration/amendment forms pertaining to Mark Brnovich . -- Foster Angels of Arizona Serving Together, Inc. 2007 annual report . -- Rick Medina September 16, 2013 interview audio . -- Arizona Department of Gaming Brnovich background materials provided pursuant to public records request (request filed immediately following September 16 interview) . -- Brnovich resume on file with Arizona Senate per May, 2009 confirmation hearing . Beau Hodai is the author of CMD's in-depth study Dissent or Terror: How the Nation's Counter Terrorism Apparatus, in Partnership with Corporate America, Turned on Occupy Wall Street. Find more of his investigations DBA Press .